Deep, pitch-black mirrors scarce for 1950 Washingtons! 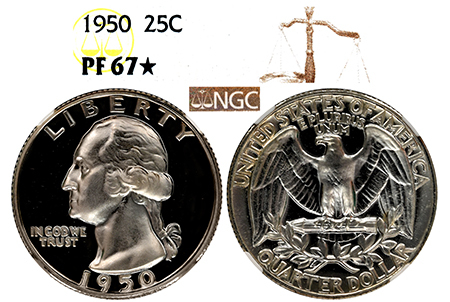 The average 1950 Quarter features shallow mirrors that can almost resemble Mint State quality. However, this example has deep, pure-black mirrors that don’t come around often for 1950 Proofs! The obverse holds a smooth Cameo layer, with Washington looking snow-white against the mirrors. A fine accomplishment for a year with only 201 TOTAL Washingtons graded in Cameo condition! 1 of 26, offering superb quality with extremely clean haze-free and tone-free mirrors!